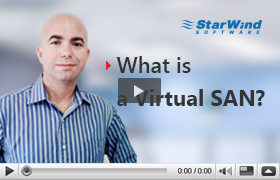 StarWind Virtual SAN is entirely software-based, hypervisor-centric virtual machine storage. It creates a fully fault-tolerant and high-performing storage pool that is built for the virtualization workload “from scratch”. StarWind Virtual SAN basically “mirrors” inexpensive internal storage between hosts. Virtual SAN completely eliminates any need for an expensive SAN or NAS or other physical shared storage. It seamlessly integrates into the hypervisor for unbeatable performance and exceptional simplicity of use.